In theory we are supposed to be experiencing tropical storms at this time of year, but like last year the rain just isn’t falling across this part of northern Australia. It is hot and humid and we do get the occasional teasing rumbling clouds, but the rain storms are isolated and not bringing the rain to the land that needs it so desperately. The ephemeral lakes are struggling to fill up this year and the birds are dispersing in search of water and places to breed. Maybe we will see a cyclone form before the end of our Wet Season and bring us much needed rain, but for now it is not looking too promising. The lack of rain last year meant that the birds were soon concentrated around what water did remain and although it did make for some excellent bird watching at those areas it was worrying. 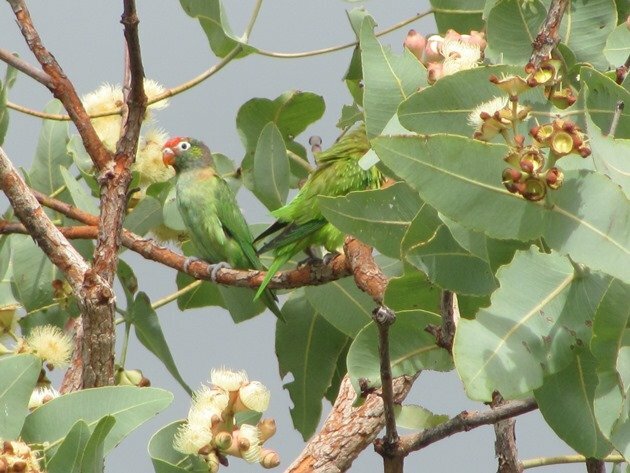 One unusual sighting in the town of Broome at the end of last year was the arrival of Varied Lorikeets. This species was never a regular bird species in Broome at all and was only occasionally observed. 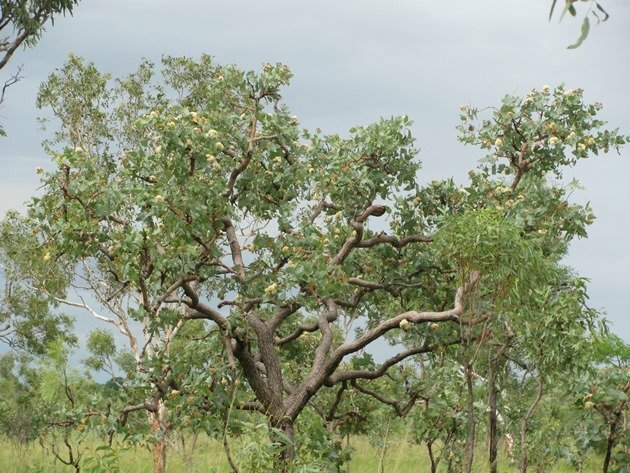 Last year they arrived in force and they soon established where the mango trees were and took preference over the fancy varieties rather than the common mango that lines some of Broome’s streets! In flight they look like a Budgerigar that has a very short tail due to their green colouring and the fact they are often in quite large flocks calling as they race across the sky. 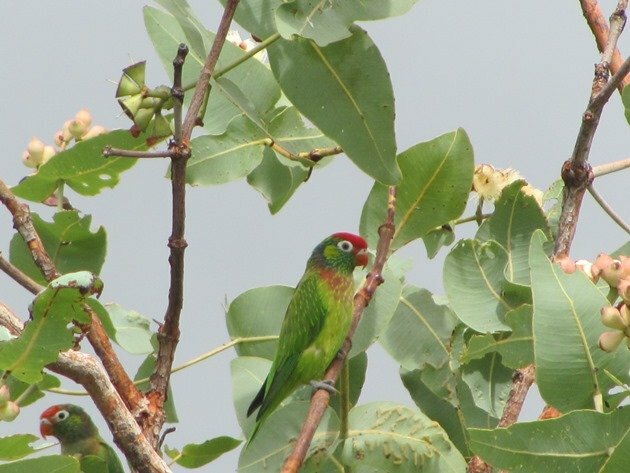 We had seen large flocks of Varied Lorikeets at Ellendale Dam last September when they came to drink in the early morning, but it appeared impossible to get close to them to capture their features. When we returned recently to check on our Tawny Frogmouth nest, which became a Tawny Frogmouth family, we were delighted to hear the sound of Varied Lorikeets as soon as we opened the vehicle doors. All of the native Eucalypts were in full flower and the Varied Lorikeets were enjoying the nectar along with the Banded Honeyeaters. 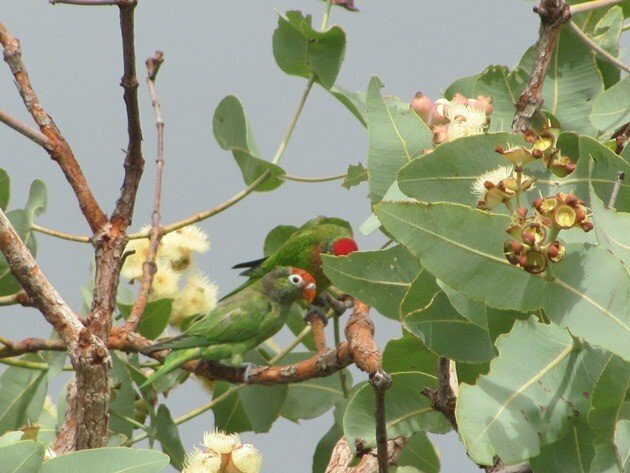 Varied Lorikeets are very bright green, but they can hide so easily in the foliage and I decided to focus on just capturing a pair of them feeding. If it was not for the very bright red feathers on their heads then the camera would have surely failed to find them! Both birds are in the photographs, but it is hard to find them! 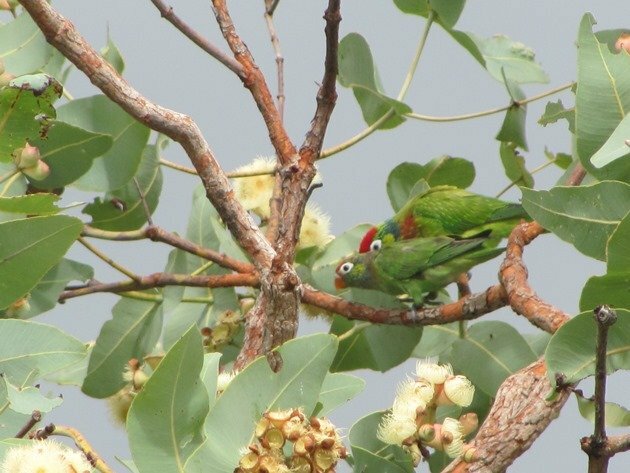 A pair of Varied Lorikeets with one trying to hide on the lower left in all three photos! What amazed me about this species is that if you search for it online you find pages and pages for them for sale! If you refer to Birdlife Australia’s birdfinder you hit a blank page with no information whatsoever on this species. Consulting the birdfinder on Birds in Backyards produced the exact same results! Why would we have such a beautiful native bird that does not even get a mention apart from as a caged species? So often our native birds end up in cages both here and around the world. No doubt many of you are familiar with Zebra Finch and Double-barred Finch, which we see on a daily basis in the wild. 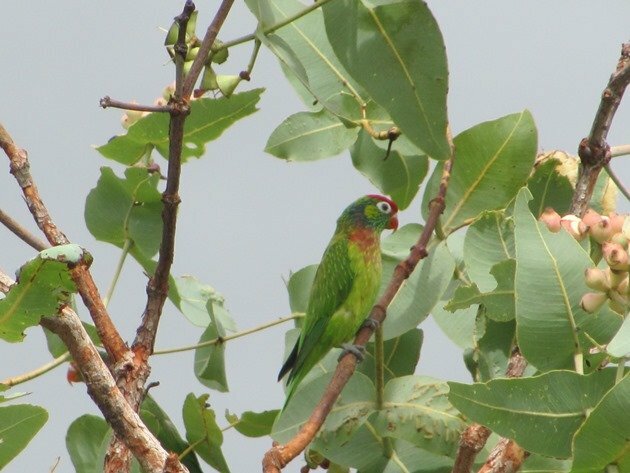 Please don’t be disillusioned by the absence of the Varied Lorikeet on the websites featuring our native birds. Head for the north of Australia and enjoy them in their natural habitat! Maybe this post will “bump” those other websites off the front page of the search engines when you look up Varied Lorikeet and you are not interested in buying one! 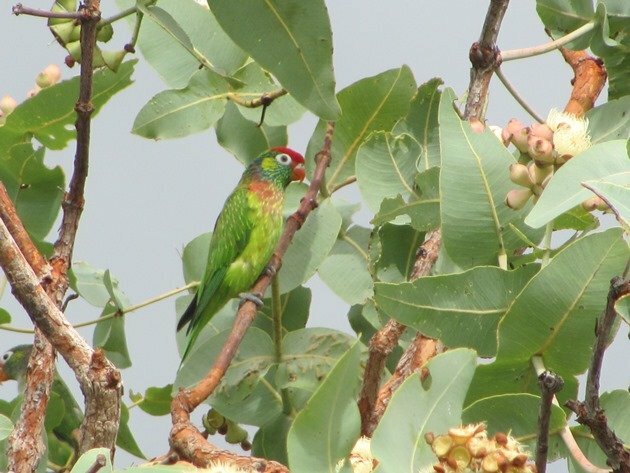 Hopefully the next member of the finch or lorikeet family that you see is in the wild!